I think it might be a stretch to say that fondue is our family’s Valentine’s Day tradition, but we will often have fondue to celebrate the occasion. I must admit that for me having a fondue has never really been about trying a new recipe or experimenting with new dishes. More often than not, the food is simply prepared and the dips are often not even homemade. For us, having a family fondue is not about preparing a fabulous meal, but all about the process and more than anything an evening devoted to great conversation and quality family time. I love that we are all totally committed to the experience and no one is on their “device” or checking the scores in the hockey game. Everyone is totally engaged, communication barriers are stripped down, frustrations from the week gone and our spirits are fed with good (not great) food and a generous dose of family love and relationship building. Again, I am not hung-up on the menu at all. It is really all about uninterrupted family time. Here is what we had for our 2014 Valentine’s Day fondue. Broken bread for the cheese fondue. 2. Potatoes Romanoff ~ These potatoes are super easy to make and so yummy. I somewhat followed the recipe from About.com. I added a bit of minced garlic and butter to mine. I used extra old white cheddar and some Velveeta cheese I had leftover from another recipe. I thought it was a great way to use it up. 3. Salad – Just a basic “clean your fridge out” type salad. I tossed in whatever I had on hand and put out a choice of dressings. 4. Meat – I cut up the chicken, steak and beef into bit sized chunks. I generally don’t prepare it in any way, but I did decide to marinate the meat for a few hours before dinner. I think it really added to the flavour and tenderness of the meat. Both the pork/beef marinade and chicken marinade were super easy to make and contained ingredients I had on hand. I also wanted to make sure that the flavours weren’t so powerful that you couldn’t enjoy your favourite dips. These recipes worked out great and the flavours worked well with all of the dips I had out. We also had raw shrimp which required no preparation. 5. Dips – When preparing a fondue for company, the dips become a more important part of the meal. I found some great dip recipes on Multitasking Mom and will definitely give some a try in the future. However, my kids are not really that in to the dips and at this point it is really not worth the extra effort. I did make one homemade dip using a recipe I found on Martha Stewart. I chose her Horseradish-Mustard Sauce as I knew Tim and I would both enjoy it with our steak. It turned out well and the left over dip will be great served with the pot roast I am planning for later this week. This recipe makes about 1 1/2 cups, so I scaled the recipe down to about 1/3 and it filled my little dipping cup and we still have lots left over for the roast. Combine the following ingredients in a bowl and season with salt and pepper. Other dips that we serve have included: Seafood Sauce, Warm Butter and Garlic, BBQ Sauce, Honey Dill Sauce, Honey Mustard Sauce, Teriyaki Sauce, Sweet Chili Sauce as well as many others. I generally do a combination of store bought and homemade, depending on whether we are entertaining or not. 6. Chocolate Fondue – Clearly this is the best part. The kids love chocolate fondue and will often request it at various times throughout the year. Eden often asks for it at her birthday parties. It is super easy to make and always a crowd pleaser. I have used the same Canadian Living Chocolate Fondue Recipe for years. Place the chocolate chips in your fondue pot/bowl. (I use a ceramic bowl that sits on top of a candle for my chocolate fondue). Heat the whipping cream until hot and steaming, but not yet boiling. (You can do this on your stove top or in the microwave. I use the microwave.) Pour the hot cream over the chocolate chips and let it sit for about 2 minutes. Stir until the chips are melted and the mixture is smooth. Stir in the vanilla. Set over low flame to maintain the smooth consistency. Cookies ~ left over cookies are great to use. We have used left over shortbread, sugar cookies and last night we used Red Velvet Crinkle Cookies and they tasted awesome dipped in chocolate. If we don’t have any in the house, I have bought wafer cookies, lady fingers and/or shortbread in lieu of homemade. Cake/Brownies ~ Pound cake and brownies both work well. Those little round brownies that can be purchased in the bakery section of the grocery store in brown bags are very good. With both cookies and cake, I cut them into smaller chunks. I have sometimes bought those tiny frozen cream puffs for dipping as well. Marshmallows ~ Jumbo marshmallows cut in half are simple to prepare and tasty to dip. Pretzels ~ I will sometime put pretzel sticks out as well. I love that salty/sweet combo. Well, I must say that we had an incredible evening. I was a bit disappointed when the kids said they wanted to go to youth group, but it actually worked out perfectly. We enjoyed a lengthy early dinner and then Tim dropped them off at 7 pm. While they were gone, I cleaned up dinner and prepared the dessert fondue and had some time to relax as well. When they came home, they were excited to get back to the table and pick-up our conversations right where we left off. Life is so crazy busy and I find that sticking to a regular family sit down meal time is not always easy with Tim’s shift work and the kid’s activities. Time is so sacred and it just seems to get away from us. 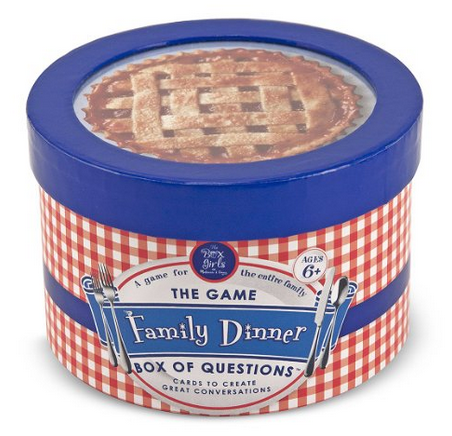 On an evening like this, one of our favourite things to do is sit around the table and answer questions from our “Family Dinner Box of Questions“. This like a game, but there really isn’t a winner (at least not how we play). It is simply a box of cards with questions that are conversation starters. We all love this. Some of the questions are quick and don’t provoke much talk, but others seem to dig a little deeper and are the spring-board for great conversation. Last night, I even learned something new about my husband ~ never even knew that he always wanted to learn to play guitar. Go figure! It forces you to open up discussion on topics you might not have thought of discussing, helps you to learn more about how the members of your family think and feel about certain topics and is just a great way to connect. Our issue is more one of not being able to stop once we get started. The great thing is that you can do the same questions again on a different occasion and the answers might be totally different. This makes a great gift idea as well! My mom passed away 15 years ago on February 13th. I can’t believe how fast the time has gone. I had kept a journal for a brief period around the time my mom passed away. I came across it the other day and read the entries on the days surrounding her passing. Last night, I shared a bit with my kids. One of the things that she said several times on her very last day with us was to “Never forget that it is the small things in life that count“. As we connected through of “box of questions” and conversation last night, her words of wisdom were so evident. The most memorable experiences weren’t of glitz and glamour, but of family road trips and camp fires. The thing my son would like most is not a new toy or device, but for my husband to get a job in which he doesn’t work the night shift, so he could be home at bedtime. Sometimes, we try so hard to give our kids the world, when all they really want is quality time! My mom was a wise woman and is still missed so much! Posted on February 15, 2014 by Cindy Roy •	This entry was posted in Family, Main Course, Recipes and tagged chocolate fondue recipe, family dinner box of questions, family fondue night, family fun, fondue, fondue beef marinade, fondue dip recipes, fondue pork marinade, fondue recipes, quality family time. Bookmark the permalink. Love your blog! Thank you for mentioning my site as well! Thanks Margo! I enjoy your blog as well.